CHARLOTTE, Mich. (AP) — The former president of Michigan State University is making her first appearance in court since being charged with lying to investigators about her knowledge of sexual assault allegations against former sports doctor Larry Nassar. 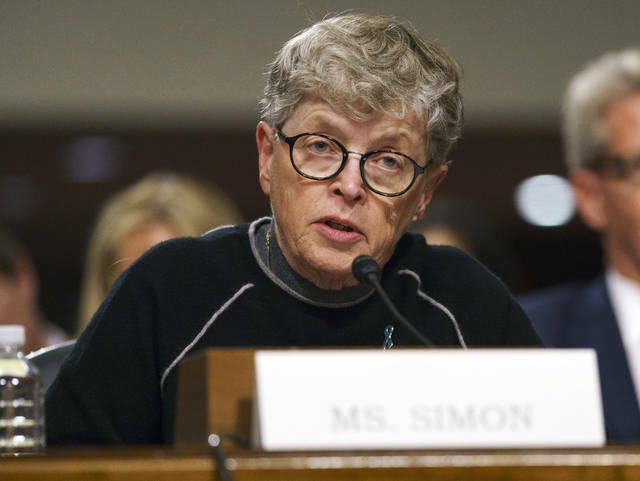 Lou Anna Simon’s attorney says the allegations have no merit. But authorities say she specifically knew in 2014 that Nassar had been accused of molesting a woman at a campus clinic. State police say Simon received a detailed file about the allegation. Simon told state police in May that she only knew that a complaint had been filed against a sports doctor. She’s charged with making false statements, a felony. Simon is due to be arraigned later Monday in an Eaton County court. She resigned in January after Nassar was sentenced to decades in prison for molesting young women and girls. André Boehman serves on the Technical Advisory Board for Oberon Fuels (San Diego, CA). Prof. Boehman has received research funding from the US Department of Energy, National Science Foundation, US EPA, US Army TARDEC and other federal agencies, various state organizations and many industrial partners. President Donald Trump has promised his supporters in Iowa that the federal government will take a step that may increase corn ethanol sales. This plant-derived fuel, which comprises about 10 percent of the 143 billion gallons of gasoline Americans buy each year, is a kind of alcohol made from corn. The industry first emerged in 1980s with government support, after interest in making the country less reliant on imported oil surged in the 1970s. It later acquired a second purpose: lowering greenhouse gas emissions. I have spent the last 24 years studying alternative fuels and fuel blends. Based on my research, and as a consumer, I can say that increasing the amount of ethanol blended with gasoline creates problems with older engines and potentially increases air pollution due to increased fuel evaporation while doing little to curb climate change. Americans have been mixing ethanol and gasoline since Henry Ford touted the potential of biofuels. His Model T could run on gasoline or ethanol or a combination. But ethanol use only took off in the 1970s following the energy crisis. Its use expanded greatly during George W. Bush’s administration, with the advent of the Renewable Fuel Standard in 2005. This federal program mandated that increasing amounts of renewable fuels be mixed with gasoline and diesel. The program has set a target for the domestic consumption of 15 billion gallons of corn ethanol since 2015. Ford made its first flex-fuel car a century ago. Most engines can safely run on a blend of 90 percent gasoline and 10 percent corn ethanol, the standard formulation known as E10 that is available at most American gas stations. E15 is a blend containing 15 percent ethanol. This blend is not available in every state. And where E15 is sold, it isn’t currently available year-round. That’s because the additional 5 percent of ethanol, combined with summer heat, would increase the tendency of blended fuels to evaporate The evaporated emissions from fuels can contribute to the formation of ozone, a major component of smog. In hotter weather, ethanol can exacerbate pollution problems in cities. Trump’s proposal would eliminate the existing summer ban on E15 sales. Removing the ban would probably boost ethanol sales, aiding farmers who grow the corn used to make the roughly 16 billion gallons of it the U.S. produced in 2017, including exports, and the ethanol industry overall. Because a higher percentage of ethanol means a lower percentage of petroleum, using more ethanol hurts petroleum refiners. It would also pose a logistical challenge. Ethanol cannot go into oil or gas pipelines because it absorbs excess water and impurities within pipelines. That means rail cars and tanker trucks transport all ethanol. Although ethanol proponents say its use cuts carbon emissions, the evidence is mixed. The government has determined that corn ethanol is much less effective than other biofuels at reducing carbon emissions, producing only 1.5 to 2.1 units of energy for every unit used to produce it. This is much less efficient than biodiesel made from soybean oil, which produces 5.5 units of renewable energy for every unit consumed in production. The ethanol Brazilians make from sugarcane residues does a much better job of shrinking that country’s carbon footprint. Converting sugarcane wastes into ethanol produces more than 9.4 units of energy for every unit that producing this fuel consumes. One of the original goals behind mandating ethanol blends was to reduce oil imports. While corn ethanol does directly displace gasoline consumption, other efforts to reduce oil imports have had far more impact. The share of oil the U.S. imports has fallen in recent years, but that decline is largely due to a domestic production boom brought on by hydraulic fracturing, often called fracking, horizontal drilling and other technological advances. Increased domestic output has displaced 54.5 billion gallons of imported oil annually – more than three times the roughly 15 billion gallons of oil per year ethanol is displacing. Biodiesel and renewable diesel, made from vegetable oils and animal fats, are displacing another nearly 3 billion gallons of diesel derived from petroleum per year. The problem is that blending ethanol with other fuels lowers their energy content, slightly decreasing fuel economy. It may cost a bit less to fill up your tank but based on my calculations the decrease in miles per gallon that E15 would yield will mean it makes no difference on your wallet. Likewise, the claim that E15 leads to cleaner air is not justifiable. For one thing, all vehicles made since 1975 have catalytic converters that remove unburned hydrocarbons and other airborne pollutants. For another, the Energy Department has not detected any across-the-board reduction in tailpipe emissions associated with ethanol use. Instead, it has observed that using more ethanol may slightly increase the tailpipe emissions of aldehydes, which are respiratory irritants. All cars since model year 2001 can operate safely on E15, but not older cars. Vehicles manufactured before 2001 could suffer fuel system or engine damage if they’re run on E15. The government requires the labeling of all E15 fuel pumps to prevent accidental use for this reason. A bipartisan bill is pending in Congress that would take this notification further by making the labels bigger and mandating that they warn consumers to check their owners’ manuals. Another problem is that concentrations of ethanol in excess of 10 percent can hurt non-automotive engines, the Energy Department has found. These include, for example, the motors in lawn and garden equipment, motorcycles and speedboats. Smaller engines lack computer controls able to adjust to operation on ethanol blends. If, say, the chain on your chainsaw engages without you intending it to, you could be in real danger. This malfunctioning can potentially cause accidents in which people lose fingers or even limbs. Even once manufacturers redesign their weed-whacker and chainsaw engines to become compatible with higher ethanol blends, consumers who own older equipment would remain at risk of having them break down due to changes in fuel composition if E15 becomes the norm at filling stations. In short, year-round sales of E15 probably aren’t going to do much to reduce oil imports or trim the nation’s carbon footprint. It would take more ambitious and strategic energy policies to achieve those worthwhile goals. Disclosure statement: Michael Foley does not work for, consult, own shares in or receive funding from any company or organization that would benefit from this article, and has disclosed no relevant affiliations beyond their academic appointment. Each year the holidays bring with them an increase in both the consumption of alcohol and concern about drinking’s harmful effects. Alcohol abuse is no laughing matter, but is it sinful to drink and make merry, moderately and responsibly, during a holy season or at any other time? As a historical theologian, I researched the role that pious Christians played in developing and producing alcohol. What I discovered was an astonishing history. Wine was invented 6,000 years before the birth of Christ, but it was monks who largely preserved viniculture in Europe. Religious orders such as the Benedictines and Jesuits became expert winemakers. They stopped only because their lands were confiscated in the 18th and 19th centuries by anti-Catholic governments such as the French Revolution’s Constituent Assembly and Germany’s Second Reich. In order to celebrate the Eucharist, which requires the use of bread and wine, Catholic missionaries brought their knowledge of vine-growing with them to the New World. Wine grapes were first introduced to Alta California in 1779 by Saint Junipero Serra and his Franciscan brethren, laying the foundation for the California wine industry. A similar pattern emerged in Argentina, Chile and Australia. Monks and priests also found new uses for the grape. The Jesuits are credited with improving the process for making grappa in Italy and pisco in South America, both of which are grape brandies. And although beer may have been invented by the ancient Babylonians, it was perfected by the medieval monasteries that gave us brewing as we know it today. The oldest drawings of a modern brewery are from the Monastery of Saint Gall in Switzerland. The plans, which date back to A.D. 820, show three breweries – one for guests of the monastery, one for pilgrims and the poor, and one for the monks themselves. One saint, Arnold of Soissons, who lived in the 11th century, has even been credited with inventing the filtration process. To this day and despite the proliferation of many outstanding microbreweries, the world’s finest beer is arguably still made within the cloister – specifically, within the cloister of a Trappist monastery. Equally impressive is the religious contribution to distilled spirits. Whiskey was invented by medieval Irish monks, who probably shared their knowledge with the Scots during their missions. Monk sneaking a drink. Scanned from Den medeltida kokboken, Swedish translation of The Medieval Cookbook by Maggie Black, via Wikimedia Commons. Chartreuse is widely considered the world’s best liqueur because of its extraordinary spectrum of distinct flavors and even medicinal benefits. Perfected by the Carthusian order almost 300 years ago, the recipe is known by only two monks at a time. The herbal liqueur Bénédictine D.O.M. is reputed to have been invented in 1510 by an Italian Benedictine named Dom Bernardo Vincelli to fortify and restore weary monks. And the cherry brandy known as Maraska liqueur was invented by Dominican apothecaries in the early 16th century. Nor was ingenuity in alcohol a male-only domain. Carmelite sisters once produced an extract called “Carmelite water” that was used as a herbal tonic. The nuns no longer make this elixir, but another concoction of the convent survived and went on to become one of Mexico’s most popular holiday liqueurs – Rompope. Made from vanilla, milk and eggs, Rompope was invented by Clarist nuns from the Spanish colonial city of Puebla, located southeast of Mexico City. According to one account, the nuns used egg whites to give the sacred art in their chapel a protective coating. Not wishing the leftover yolks to go to waste, they developed the recipe for this festive refreshment. So why such an impressive record of alcoholic creativity among the religious? I believe there are two underlying reasons. First, the conditions were right for it. Monastic communities and similar religious orders possessed all of the qualities necessary for producing fine alcoholic beverages. They had vast tracts of land for planting grapes or barley, a long institutional memory through which special knowledge could be handed down and perfected, a facility for teamwork and a commitment to excellence in even the smallest of chores as a means of glorifying God. Second, it is easy to forget in our current age that for much of human history, alcohol was instrumental in promoting health. Water sources often carried dangerous pathogens, and so small amounts of alcohol would be mixed with water to kill the germs therein. Roman soldiers, for example, were given a daily allowance of wine, not in order to get drunk but to purify whatever water they found on campaign. And two bishops, Saint Arnulf of Metz and Saint Arnold of Soissons, are credited with saving hundreds from a plague because they admonished their flock to drink beer instead of water. Whiskey, herbal liqueurs and even bitters were likewise invented for medicinal reasons. Disclosure statement: David W. Rasmussen does not work for, consult, own shares in or receive funding from any company or organization that would benefit from this article, and has disclosed no relevant affiliations beyond their academic appointment. Partners: Florida State University provides funding as a member of The Conversation US. In 1959, more than a third of all elderly Americans lived in poverty. Slashing that number to under 10 percent by the late 1990s was among the great U.S. triumphs of the 20th century. Social Security deserves a large share of the credit. I believe eliminating old-age poverty entirely could one day be deemed a triumph of the 21st century. Even sustaining it at 10 percent would be a significant achievement. But that meager goal is in serious jeopardy. My research shows more Americans are increasingly struggling to save enough for their later years. And one of the main ways they have left, Social Security, is just 15 years away from going broke. This leads me to ask one question: Do Americans want to return to a time when so many of their elders died in poverty? Since its advent in 1935, Social Security has been one leg of Americans’ three-legged retirement stool. The other two have been the wide availability of defined benefit retirement plans and personal savings supported by broadly shared economic prosperity. This stool turned out to be remarkably successful by reducing the poverty rate among Americans aged 65 and older from as high as 78 percent in 1939 to 35 percent in 1959 – as Social Security benefits began kicking in – to 10 percent by 1995. But in recent decades, the defined benefit plans and worker savings legs have become increasingly wobbly. If they break entirely, saving Social Security becomes even more vital. For much of the 20th century, defined benefit plans promised an annual lifetime payment determined by salary and played an important role in the financial security of many households with residents over 65. Rising life expectancies required companies to pay out benefits for much longer, making them more expensive and risky. Coupled with uncertain investment returns, companies have been getting rid of them in a hunt for savings and more profits for shareholders. Only 16 percent of Fortune 500 companies offered such plans in 2017, compared with 59 percent just two decades ago. The Department of Labor reports that the number of active participants in these pension programs as a percent of the labor force peaked in 1981 at 28 percent. Only about 9 percent participated in 2015. Instead, they’ve shifted to defined contribution plans like the 401(k), placing the financial risk of retirement on workers. That might have been OK, had working and middle-class Americans continued to share in the nation’s prosperity. But increasingly, that is not happening. That’s in part because employment growth in the U.S. is now concentrated among highly skilled workers and low-paying service sector jobs, leaving fewer and fewer positions that provide enough income to set aside money for savings. My research shows job opportunities are increasing most rapidly in positions that pay less than US$30,000 thanks to automation as well as the growing demand for personal services – and the accompanying low wages. These types of jobs do not share as much in the fruits of economic growth. In short, the American dream, characterized by the hope that children will have a higher standard of living than their parents, is fading. Ninety percent of children born in 1940 made more than their parents at age 30, but only 50 percent of those born in 1984 had higher income at that age. This means many more Americans will not be able to set aside much money for retirement, whether in terms of personal savings or a plan like a 401(k) or an IRA. And it’s why personal savings is the shortest leg on the retirement financial stool and it will become shorter as a result of widening income inequality. Without more revenue, Social Security will have to cut benefits by 2034. Even if current benefits are sustained, increasing low wage employment will result in lower benefits because they are determined by lifetime earnings. That brings us back to Social Security, perhaps the last leg still standing for tens of millions of Americans as they head toward their twilight years in the coming decades. Increasing benefits for some Social Security recipients is required to avoid increasing poverty among retirees. The system was designed so that today’s workers pay for today’s retirees. Back in 1960, there were 5.1 workers for every recipient. That ratio is projected to fall to 2.6 in 2020. This fact, coupled with increasing life expectancy, is behind the system’s impending fiscal crisis, putting the Social Security Trust Fund into deficit. Republicans have typically argued that the best way to fix the system is to cut benefits and encourage more workers to save through through savings plans like 401(k)s and IRAs. A bill that would erase the Social Security deficit for the rest of this century would cut benefits for 75 percent of recipients – requiring them to save on their own, which is not an option for workers stuck in low-wage employment. The only alternative for those financially unprepared for retirement will be to continue to work into their 70s and beyond. But substantial evidence has shown that opportunities to work in the retirement years are greatest for the best-educated and highly skilled. That leaves the rest – the vast majority – in dire straits. The result seems inevitable: More Americans will grow old in poverty. Whether Americans will tolerate more poverty among retirees is a political question. And I believe this debate should be about values as much as affordability. The fact that other highly developed countries spend more to support their retirees makes clear the reducing poverty among retirees is a matter of commitment, not affordability. So if Americans agree that our elders should never again return to having to age in poverty, there are several ways we can shore up the Social Security system. One involves extending the Social Security tax to include all earnings: In 2018 it was levied on only the first $128,000 of income. Another is more controversial but may be necessary: use general government revenue, financed by higher taxes on the wealthy, to permanently ensure Social Security remains a bedrock of retirement. While increasing taxes is hard, the only question is whether we have the political will to do so.